Kids seem to love having their own little spaces to do just about everything. A special bunk bed, a reading nook, a top secret fort all give them a chance to do what they love best in their own little world. Little Tikes created the Easy Store Picnic Table for children ages 3 to 8 years to have their own little spot for indoor or outdoor play. 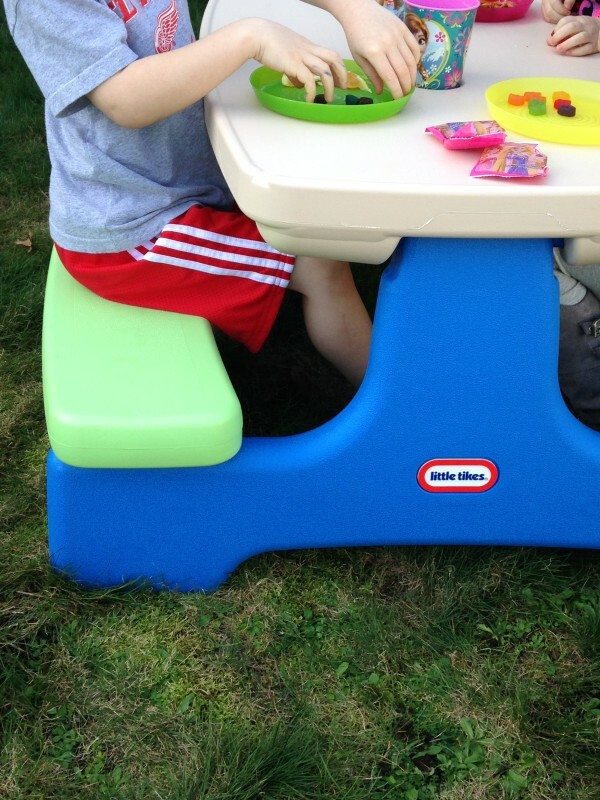 I received a Little Tikes Easy Store Picnic Table in exchange for an honest review. All opinions are my own. You may already be familiar with Little Tikes, as a handful of their products have been around since they were first founded in 1970. Ten million of their red and yellow Cozy Coups have sold since they were first produced. Little Tikes’ goal is to supply thoughtful and imaginative products to consumers worldwide. They regularly test and retest their products for lead and other heavy metals, and they do not use BPA, lead, or phthalates in their plastics. Most of their products, like the Easy Store Picnic Table are made in the USA. From a flat folded position the Easy Store Picnic table has two pieces underneath that snap and secure in place before it is turned upright and ready to use. Once unfolded, the table is 42” long by 38” wide by 19” tall and weighs 24 pounds. 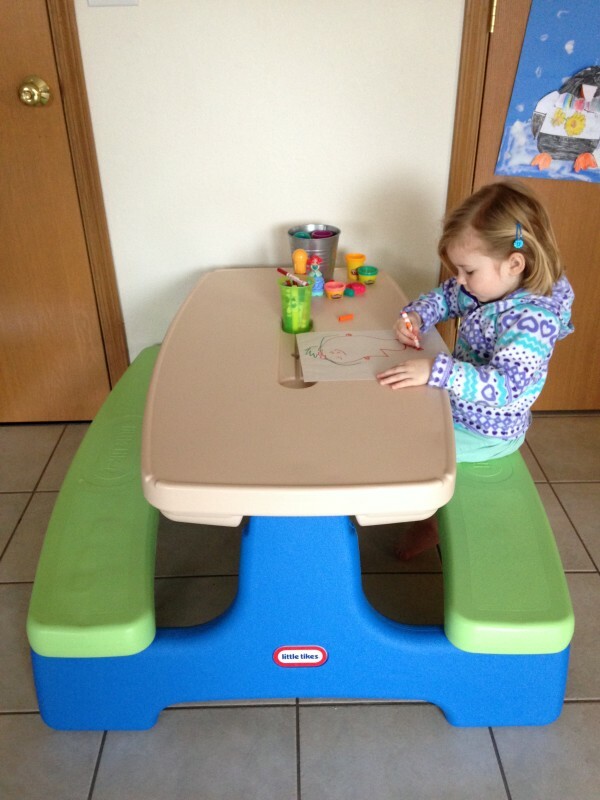 It can fit up to 3 children on each side, and has ample table space for eating or other activities. The table has two cup holders and a hole for an umbrella, which you can buy separately. This picnic table is really easy to collapse when you’re ready to store it away. Its flat folded design allows you to store it in a deep closet or along a garage wall. Since it can be used for indoor or outdoor use, it’s also extremely multifunctional. We had a warmer than usual sunny day recently so I set up the Easy Store Picnic Table outside and my kids enjoyed a snack with their friends. Four children ranging in ages from 3 years to 8 years fit with room to spare. They each had plenty of leg and seat space as well. Since then I’ve brought the table indoors and it has gotten a lot of use for crafts, Legos, or whatever else my kids come up with. They like having their own child-sized table to work on. 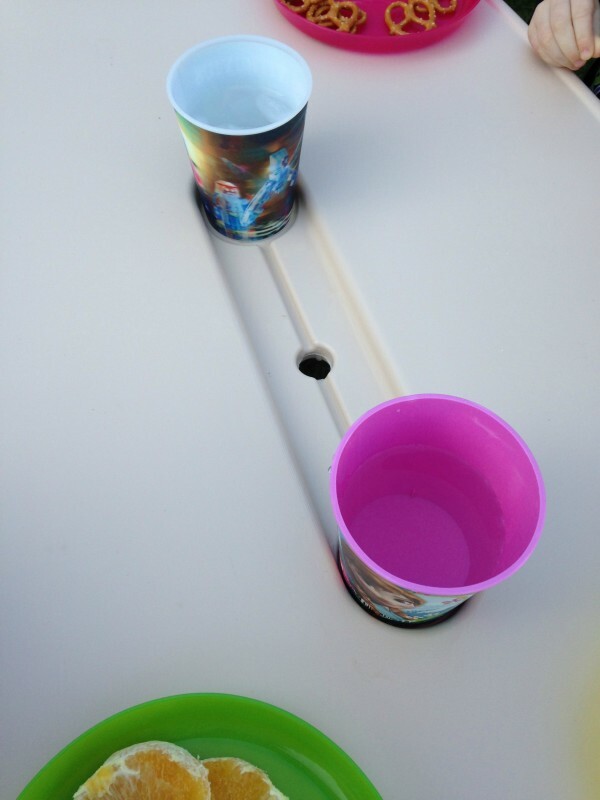 The cup hold holders come in handy with crafts to store markers and other art materials. At the end of the day the plastic seats and table are a breeze to wipe clean with a damp towel. I like knowing that it’s made with safe plastics and that I don’t need to use anything harsh to wipe it clean. 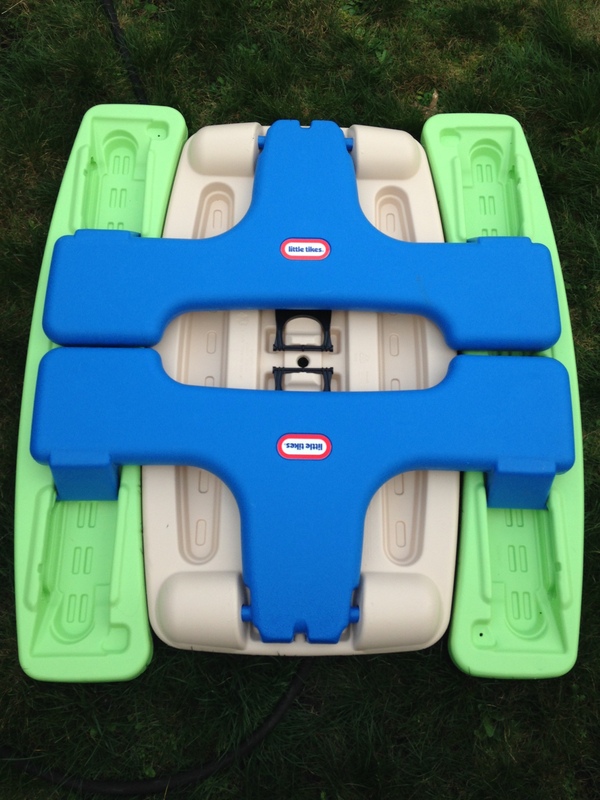 The Easy Store Picnic Table is currently sold on the Little Tikes website, www.littletikes.com for $84.99. It can also be purchased on Amazon, or at Target and Toys R Us. This is such a cute table to get for my niece and nephew to enjoy over the summer and have a nice table to sit at. I like that it can be easily folded!